Vapor barriers are a complex subject, and often a confusing one for contractors and tradespeople. In recent years, as new materials have entered the industry, the topic has only gotten more complicated. A few years ago, JLC took a look at the new crop of “smart” vapor retarders, represented by products such as ProClima’s Intello and CertainTeed’s MemBrain (see “Understanding ‘Smart’ Vapor Retarders,” Dec/15). This year, there’s yet another entry in the market, and it’s a distinctly different category of product: Majrex, introduced by the Swiss firm Siga, is an advanced vapor control membrane that not only adjusts to variable humidity like Intello and MemBrain, but actually has a greater moisture permeability in one direction than in the other. The material is intended for use in cold climates, where its purpose is to protect insulated wall and roof assemblies from indoor-generated moisture during winter, but still allow the insulated cavities to dry out towards the occupied space during summer. Siga sales manager Keith Bidwell conducts a training for contractors at Performance Building Supply, in Portland, Maine. Image courtesy of Ted Cushman of Journal of Light Construction. Based on “dry-cup” and “wet-cup” ASTM testing, the less-permeable face of Majrex is rated at just 0.16 (“dry”) to 1.3 perms (“wet”); that’s the side you install facing the conditioned space. The more permeable face opens up from 0.17 (“dry”) to as much as 3.8 perms (“wet”); that side is placed facing into the fiber-insulated wall or roof assembly. So all else being equal, moisture can move out of the wall or roof into the conditioned space three times faster than it can move in the opposite direction, into the walls or roof. 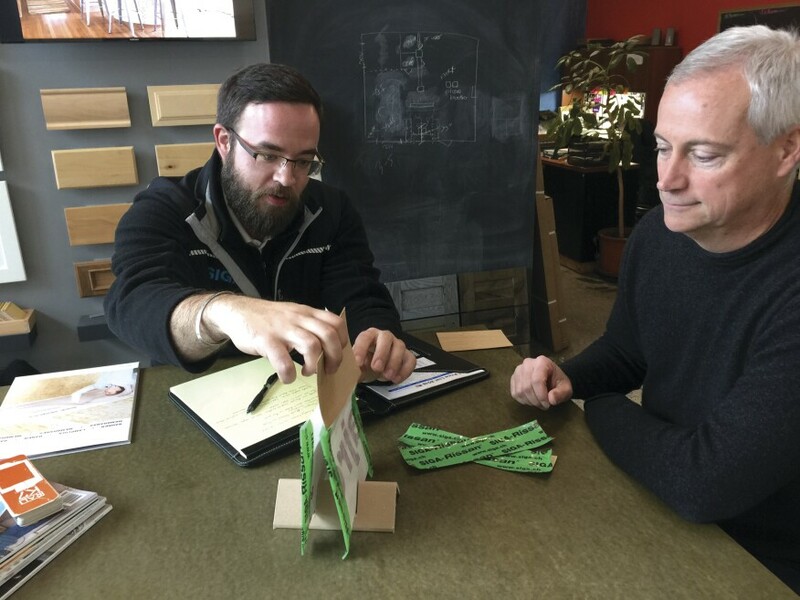 Siga rep Keith Bidwell showed JLC a simple demonstration (above): If you seal wet wood into two envelopes made of Majrex, one with the vapor-open side in, and one with the vapor-open side out, only one piece of wood will dry out. And like Intello and MemBrain, Majrex also responds to moisture conditions. In winter, when the indoor space tends to be dry, the material becomes more vapor-closed to help keep the structure dry. If the sun drives vapor inward during summer, the membrane opens up. So the effective difference between the two faces is more than triple: Depending on conditions, the variation from winter to summer could be a factor of 10 or more. The idea is that over time, insulated walls and roofs, even if they’re built wet, will dry out during summer, and then stay dry year round. At a meeting with JLC, Bidwell explains SIGA’s kitchen-table demonstration of the Majrex membrane’s directional drying properties. Image courtesy of Ted Cushman of Journal of Light Construction. The science behind Majrex is similar to the principles that make Intello and MemBrain work. All the products rely on the moisture-sensitive properties of polyamide, a relative of nylon that has the special characteristic of opening up more to the rapid passage of moisture as more water vapor contacts and penetrates it. In humid conditions, Majrex, like Intello and MemBrain, transports moisture faster through its polyamide layer. But unlike the others, Majrex has a relatively impermeable control layer laminated to its indoor-facing side; the perforations in this surface lamination let moisture pass out of the polyamide into the room air faster than it can pass from the air into the polyamide.